It’s been hard to get in the Halloween spirit when it’s 80 degrees in LA every day, so I made a little trip out to Halloweentown in Burbank. 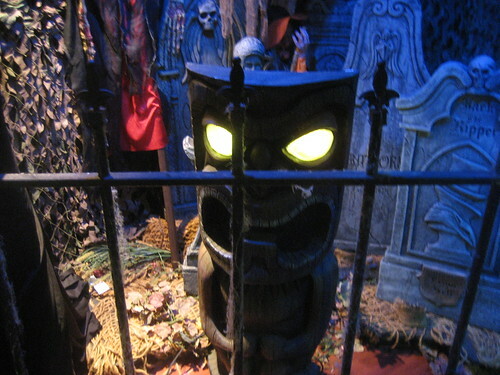 It’s a year-round source for all things kooky, spooky and…tiki! They even opened a second location down the street just for costumes, so the original store wasn’t as crazy. And that’s where I found this tiki with glowing eyes among the creepy clowns and gravestones. Meanwhile, the display case up by the cash registers had some awesome Poster Pop stickers by BigToe. 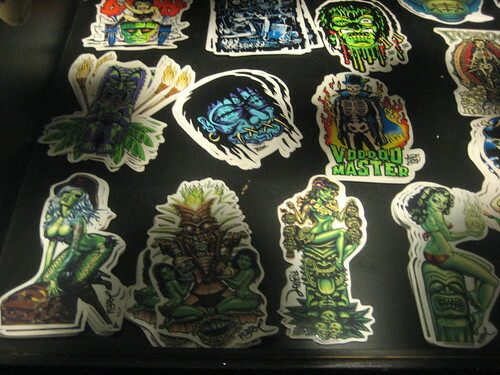 The ghoulish girls and tikis in his designs fit right in with the theme here. 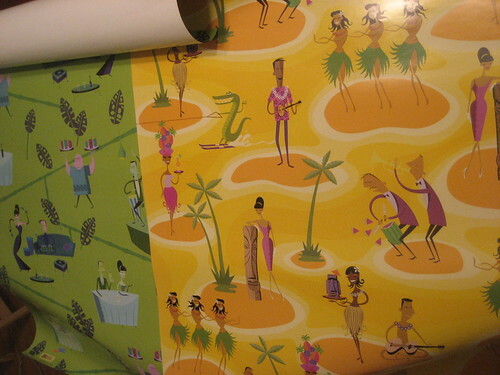 I’ve mentioned before that they have some Shag art books in stock (plus the necessary guide Tiki Road Trip) but this was the first time that I spotted Shag wrapping paper. I couldn’t decide between the two designs so I got both. There’s always something new to see (and buy) there! For more tiki Halloween fun, check out my previous posts on the Halloween Art Show at the Tonga Hut and Enchanted Tiki Room pumpkins at Disneyland. Happy Halloween!